Foods with inadequate nutrition, stored improperly or not handled safely can present problems for you and your pet. Making the right choices for the right pet will give your pet the best chance at optimum wellness. You'll have peace of mind and know your pet will receive the best health value possible. Remember, your pets are individuals and have independent needs. Your veterinarian will make recommendations during your visits to keep your pet's energy, health and well being at its best. When you purchase food keep in mind the nutritional values that are delivered with each serving. You'll want to consider whether or not your dog, cat, ferret, bird, horse, turtle, or iguana, for example, needs more protein, fat, vitamins, minerals or carbohydrates - or less. 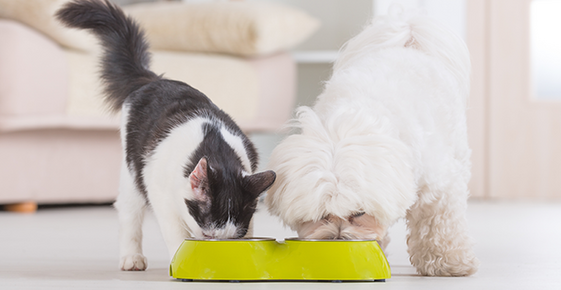 Select foods that meet your pet's independent levels of activity. Multiple pets of the same kind in the same home will have varied nutritional needs and activity levels. Remembering that your pets are individuals will help you provide for their own needs. Foods must be stored properly to provide the highest measure of safety and nutritional value for your pets. Look for containers that close tightly with a air-tight seal. Store food containers for all pets in a cool, dry area out of the reach of children. Always read the manufacturer's recommendations for storing pet foods. Pay attention to expiration dates and shelf-life provisions. Be aware of food storage and safety practices at the store your family visits to purchase your pet's food. And, make sure your animal friends will not be able to chew through the containers or get to their food between feedings. This can require immediate medical attention or create life-altering medical problems. Angela Tague advises in Dog Food Storage Safety that pet owners, "Examine the dry (pet) food before serving it to your pet. If it has clumps, appears moist, moldy or has a foul odor, throw it away and do not feed it" to your pet. It's always wise to check wet canned food items to be sure the food texture and color are consistent. Note the food containers and any damage present. Food containers that show damage should not be used because the food integrity could be compromised. Foods that seem to appear moldy, smelly, or have bugs or larvae present in the containers must not be used. Remember your pet's food is probably prepared under different guidelines and conditions than that prepared for your family. Always supervise small children, infants, seniors and those with compromised immune systems for safe handling procedures. The Center for Disease Control identified 79 cases in 21 states that occurred from contaminated dog and cat food. The cases primarily involved young children who developed the symptoms of Salmonella. The CDC suggests monitoring those in contact with food preparation and handling for family pets to ensure safety precautions are used. Safe handling includes frequent and thorough hand washing before and after scooping, pouring, measuring or handing out food items to pets including: meals of wet or dry foods, snacks and treats. Before bringing a new pet home always check with your veterinarian for feeding recommendations. You'll know what to have and how to serve it to best provide for your new animal's well being. Be aware of your pet's activity levels and let your vet know about changes. They can suggest nutritional supplements and a feeding program to continue to provide your pet with the maximum amount of nutrients needed for optimum well being. Using food safety habits in your family with keep your dearly loved animal members happy, safe and performing their best.